I am a major multitasker. In fact, I used to pride myself on being able to do many things at once thereby being efficient. I’m sure many Type A mothers use multitasking as a way to somehow get through the big to do list or the mess of a house by the end of each day. Recently, I read a post on Facebook by Caroline Leaf, author of Who Switched Off my Brain?, which said our brains aren’t meant to multitask, but rather to do one thing at a time. I was initially shocked, then a bit offended, then I thought about it and realized that, generally speaking, my mental multitasking actually brings me stress and anxiety. Sure, I can physically multitask, but that doesn’t require my brain cells working too hard. Picking up a few toys while holding a baby and instructing one toddler to get off the table comes naturally. Which is good. 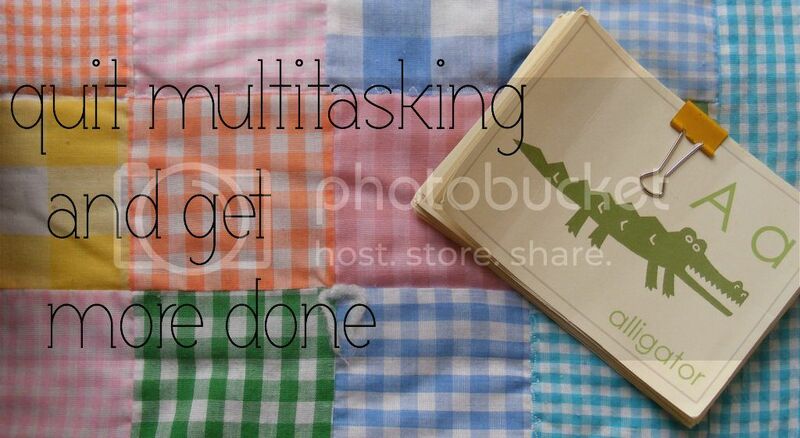 The mental multitasking we do that just reminds us of everything that needs to be done, is not. 1. Physical vs. mental multitasking. I started differentiating between mental and physical multitasking, and started focusing on just doing one thing at a time mentally. I think the ability to do many things quickly and wisely is a skill and a blessing. I’m not knocking multitasking, people. However, mental multitasking was only causing me grief. I like to differentiate them like this. Physical multitasking may be walking through the house picking up things and depositing them in other places as you are moving and carrying a baby while closing doors, windows, blinds and then grabbing a towel to give everyone a bath. You are doing a few things at once but it is not mentally taxing. Mental multitasking is doing one thing (hanging the laundry) while thinking of the other 5 million things that need to be done therefore making you rush through this one thing, and contributing to your stress levels. 2. I stopped thinking about “the list” while I’m busy doing other things. I started focusing on one area or concept instead of dividing my focus. Let me give an example. After dinner time is pretty stressful, particularly for us since my husband works in the evenings. I used to do dishes, look around and plan my attack on the toys in the living room while dreading the next 45 minutes that would include giving two toddlers baths while making sure the baby was okay. I stopped doing all that thinking and started focusing. Instead, now I focus on the kitchen while I’m in the kitchen. I do the dishes and I even dry and put them away. That may seem normal to you, but I used to just leave dishes in the dry rack until it was full then empty it. Only to fill it again. Previously, drying the dishes would have been a joke. After I let go of thinking about my list I found I had time to properly clean the counters, wipe the cabinets, sweep and even mop. And this every evening and with leisure. Instead of hurriedly dividing my attention (and having to eat off utensils with dried food I somehow missed) the kitchen is actually cleaner now. And I’m way less stressed because I just focused on that one thing. 3. Cuts back on weariness. I know myself pretty well, and it is and always has been the mental stuff that gets me down. I tend to be anxious, worried and overly concerned with the future while always feeling guilty about something. What do I feel guilty about? I don’t know. But it’s there. It is less than it used to be, but it’s there. Having a big to do list and trying to work through it all times of the day like a maniac only meant more weariness. Sure, maybe I got through the list. At the expense of my sanity. Some days I didn’t get through it, but I was still harried all day and weary at night. After a few weeks now of purposely avoiding the mental multitask I can honestly say I am less weary. And not only that, I’m still getting as much done. How? It’s simple. My mental multitasking was actually lowering my capacity to get things done because I would get so stressed and worked up that I had to stop and collapse comatose on the couch. Now, I am actually able to do more because I operate in a more peaceful state which allows me to go from one thing to the other naturally instead of like some kind of speed shopper on Black Friday. My capacity has increased even though I am doing less at once. A friend came over for a visit last week and said the home atmosphere felt noticeably more peaceful. I was very happy to hear that because, honestly, I’d noticed the same thing myself. I think it used to be less peaceful because I was fidgety. Always thinking about what needed to be done. Always waiting for a “spare moment” to cross a few things off my never ending-always growing-eat me alive to do list. Since I’ve created a better system for our to-do lists that actually cuts down on marital spats and gets more done (which I’ll share soon) and since I’ve started just doing one thing well, everyone is more at rest. Some things I would have never attempted to do while the kids are running around, I actually try to involve them in. The home atmosphere is noticeably more peaceful and that is simply an unanticipated positive side effect. It’s a work in progress and sometimes everyone is screaming and having contagious meltdowns. But that’s life. I think half of parenting – heck, half of life – is about learning how we best function. If x must be done, there will always be 13,356 ways to accomplish it. You may do it differently than me and I may do it differently than you, but there is great joy and peace in figuring out systems that help us to accomplish x with peace and harmony. Good food for thought here. I too find myself harried for most of the day and wondering how to get it all done, all while wishing for a more peaceful home. Maybe this is at least part of my answer. Let me know if you find any more good insights into a less harried life. I just keep thinking that I would hate to buzz through the younger years in a frenzied haze! Me too! But how do you keep your mind on just one thing when the children are mentally (and sometimes even physically) pulling you in three different directions? I know you know what I’m talking about since all of yours are littles too. I find I can only play the “roomtime” card so much. I have noticed that an overly a ambitious to-do list almost always leads to a mommy tantrum, so I try to be careful about that. And on days when I think my list may be edging toward ambitiousness (and also if someone is teething), I try to preselect at least one item/project that can be jettisoned guilt-free if necessary or prudent. I’m attempting this one task at a time thing today. Company is coming in tonight from out of town, so it’s a perfect day to try. LOTS to do! I scroll through the task to see what can be completed with the time that I have at that moment. In the mornings, I usually have enough time to hand wash the morning dishes. That task doesn’t even make it on the list. I just do it, otherwise that pile of dishes gets ridiculous by the afternoon with this family of six. My crazy monkeys help out too. My two girls, ages 7 and 5, love to play with/wash dishes. So on weekends, I let them do the non greasy dishes (ONLY, otherwise it is another mess for me to clean up off the floor, countertop, their wet clothes…you get the picture.) My two older ones split up the leftover dishes, tidying up the table, making their lunches from leftovers. My oldest daughter washes the pots and pans (cups and food storage containers) and my 11yr old son will do the rest. Nobody complains. I look at my list at the end of the day. If I’ve crossed out just one task, I am happy. Because there are those days where something just came up. So what if the task only took me 5 minutes to do. That is one less task AND more than likely, I would have not gotten to it had it been shelved in the crevices of my scattered brain. Gail, I LOVE your idea of playing music to keep you focused on that one thing instead of letting your mind wander. That’s a great idea. And I’m with you, I’ve started putting things on paper so I can forget about them and focusing on a few. We could never do everything!